Vouchers aren’t a solution for helping build a solid education foundation for Oklahoma’s children. We urge legislators to work with parents and education leaders at all levels for real solutions to support the 700,000 students in their public schools. (To learn more about the state’s tuition-tax credit voucher program called the Equal Opportunity Scholarship Act, click here). SB 570: On Feb. 12, the Senate Education Committee voted down SB 570 to expand private school vouchers. See the vote here. SB 901: On Feb. 19, The Senate Education Committee passed SB 901 to expand private school vouchers. See the vote here. SB 570: This bill has twice been laid over in committee. (Please let OSSBA Director of Government Affairs Rooney Virgin know how your lawmaker said he/she would vote by emailing her or completing our advocacy feedback form). SB 360 would expand the Lindsey Nicole Henry Scholarship Program for Children with Disabilities to include vouchers for children who have an incarcerated parent. Such children would be eligible for the program even if they don’t have an Individualized Education Plan and would also be exempt from the requirement requiring prior year public school attendance. SB 570 seeks to essentially duplicate the Lindsey Nicole Henry voucher by creating the Hope Scholarship Program. The new program would award private school vouchers for students who feel they have been bullied or harassed. SB 901 expands the Lindsey Nicole Henry Scholarship Program for Children with Disabilities to include vouchers for children who have been identified as homeless and are enrolling in a school specifically designated for homeless students. The bills clearly divert from the original intent of the state’s voucher program to serve only children with disabilities. It continues the practice of adding groups of voucher-eligible students as a means to eventually make vouchers available to all students. 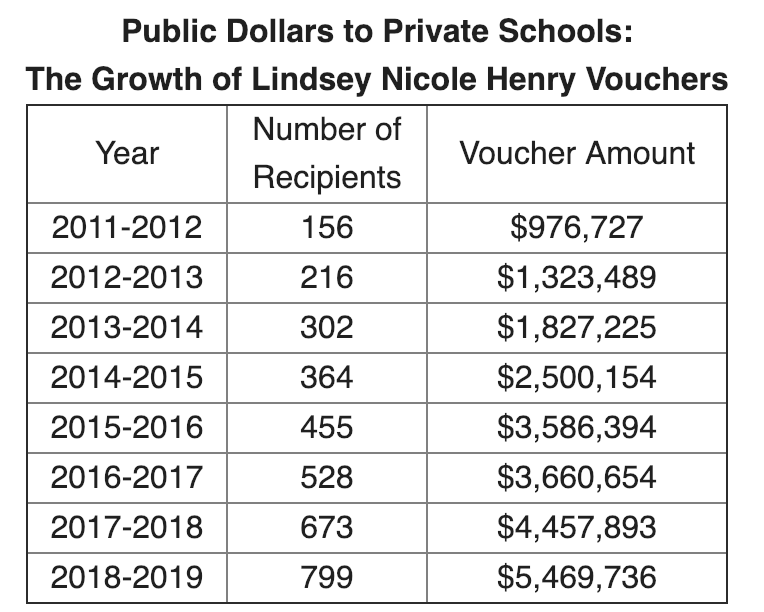 Lindsey Nicole Henry vouchers and the proposed Hope vouchers directly reduce the amount of state aid available to public schools that serve the vast majority of Oklahoma students. Public schools receive state aid funding only after vouchers funding has been set aside. From 2011 to 2018, the LNH program diverted more than $18 million in public money through parents to private schools to serve qualifying students. Voucher commitments for this fiscal year alone are expected to near $6 million – bringing the cumulative total to almost $24 million. Eroding public school funding harms the 700,000 students who attend public schools. Once a student is awarded a voucher, the voucher stays in place until the student graduates high school, even if at some point the student would no longer qualify as a new recipient. There’s strikingly little accountability for the public dollars spent on private schools nor is there any accountability for student achievement. Private schools aren’t limited in how they spend voucher money or required to account for expenses. Private schools are under no obligation to accept all students. Public schools must give state-mandated tests, adhere to state-adopted academic standards and face sanctions if students aren’t performing well. Under current law and the proposed bills, the state isn’t allowed to collect any student achievement-related data from private schools even if they receive state funding through vouchers.